Brian Casazza is covered in protective gear, just like everyone else. But the Chamberlain senior linebacker still is able to stand out thanks to his helmet-defying hair. Casazza's long, blond locks flow down his back, hiding most of his jersey. The senior has been letting his hair grow since the second grade. At first it reached his shoulders. That was by design. "I was always outside, and I was tired of getting sunburn on the back of my neck and shoulders," Casazza said. "I just wanted some cover, an extra layer of protection." Then Casazza kept letting it grow. And grow. He occasionally gets a haircut, but only trims an inch or two. The mane has become part of his persona. "People talk about it all the time," Casazza said. These are heady days for hair at Chamberlain. Quarterback Tyler Riddell has a feather-light boulder of red, curly hair that is on display whenever he takes his helmet off. Casazza's perfect coiffure takes work. He washes his hair every day, using shampoo and conditioner one day, then switching to only shampoo the next. After games, it usually takes him at least 15 minutes to thoroughly scrub his scalp. Casazza uses Pantene. But he also stands out because of his play. Casazza has been on varsity since he was a freshman and has started the past three seasons. Last year, he became a leader of the defense, recording 84 tackles and three sacks for the playoff-bound Chiefs. Casazza also does work in the classroom. He has a 4.3 weighted grade-point average. It has not resulted in any scholarship offers yet. "I really want to play in college," Casazza said. If that happens, he might have to say so long to his long locks. "I'll be okay with that," he said. "If that happens, I'll just cut it off and donate my hair." Lakewood coach Cory Moore has always been a big believer in playing teams from outside Tampa Bay, be it a spring game or a regular-season game. "That's the only way we can get better and see what the competition is like outside of Pinellas County," Moore said. The Spartans (2-1) are in the middle of a three-game stretch against out-of-area opponents. Last week they travelled to Dunnellon, winning 12-6 in overtime. Now comes a Friday night trip to Naples Barron Collier, which is 2-1 and has a 32-31 loss to Superior Collegiate. And that is followed by a Sept. 21 home game against Lehigh. Class 5A, District 9, which includes Dunedin, Tarpon Springs and Gibbs, who are a combined 1-8, is not difficult. Lakewood is as close to a playoff lock as there is. How it does against non-Pinellas opponents, as well as in an Oct. 5 game at Pinellas Park, will be a good indication of how it will fare in the postseason..
Gibbs has taken the same strategy. The Gladiators (0-3) travel to state power Lakeland; that's the third of four games against non-Pinellas teams. They have already played Tampa Catholic and Punta Gorda Charlotte and have an Oct. 19 home game against Lake Gibson. Last season Gibbs was 0-4 against non-Pinellas teams. The last time Gibbs won a game against a team outside of Pinellas was Nov. 2, 2012, against Blake. Three weeks into the season and there are only 12 teams in the area that are still undefeated. Four of those teams — Bloomingdale, East Bay, Plant City and Tampa Bay Tech — reside in Class 7A-9, which has become the area's toughest district in both quality and quantity. The unbeaten streaks won't last. After all, the four teams at the top of 7A-9 have to face each other in district play. 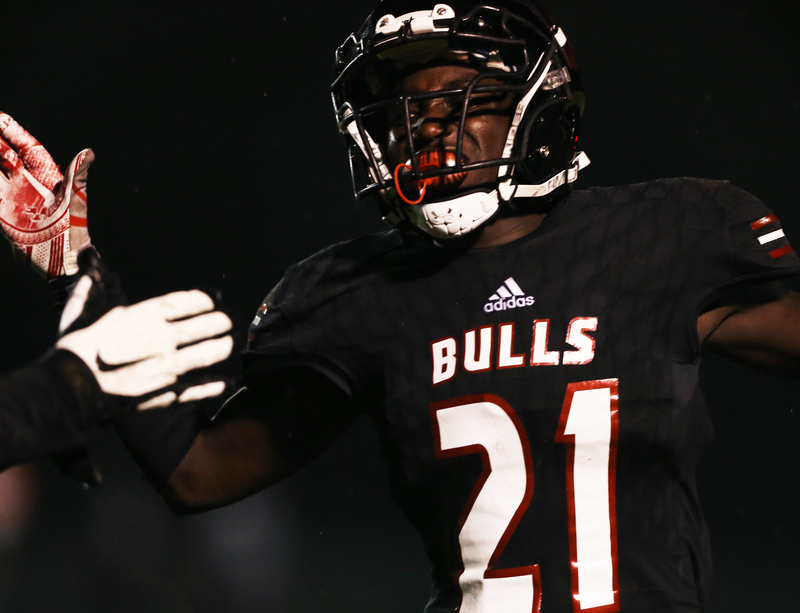 Bloomingdale (3-0): The Bulls are off to their best start in school history and have yet to allow a point. Their unbeaten streak likely will not be tested until Sept. 28 vs. East Bay. East Bay (3-0): The schedule has not exactly been daunting. The Indians' three wins have come against teams that are a combined 3-6. Their first big challenge will come next week against Plant City. Plant City (3-0): The Raiders, who started 0-2 last season, have turned things around thanks to a potent passing game. Now comes the tough part with games against East Bay (Sept. 21), Bloomingdale (Oct. 19) and Tampa Bay Tech (Oct. 26) that will determine if Plant City can make the playoffs after missing out a year ago. Tampa Bay Tech (2-0): The two-time defending district champions have already knocked off Armwood and could go undefeated in the regular season for the first time with wins against East Bay (Oct. 5), Bloomingdale (Oct. 12) and Plant City (Oct. 26). Weeki Wachee's Vaughn Sykora had not thrown a touchdown through the first two games. That changed last week. Vaughn had time and his receivers kept getting open. The result? The junior quarterback set a Hernando County record for touchdown passes in a game with six, throwing for a school-record 355 yards in a 52-14 victory over Fivay. "It wasn't just me," Sykora said. "Everyone was a part of it. The line gave me great protection and our receivers made some great catches." Sykora wanted to be a quarterback after watching Tom Brady lead the Patriots to a perfect regular season in 2007. "I played flag football and my dad watched all kinds of videos to help me get better," Sykora said. Last year, Sykora was set to become the Hornets' starter. But he broke his elbow in the spring game, sidelining him through the summer. Sykora played in every game and finished with 871 yards and 10 touchdowns, including a career-high three against Gulf. He doubled that total last week. "I knew my numbers were getting up there," he said. "The announcer kept saying what they were. To be honest, I thought that was possible. We really put everything together, and it's a big boost for us going through the rest of the season."